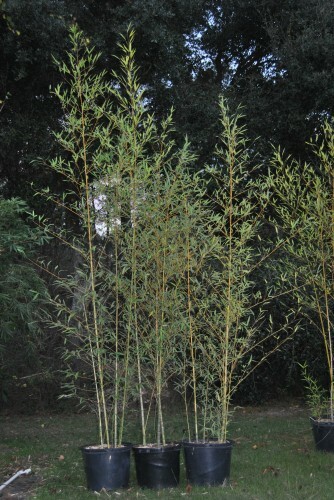 Taller-growing bamboos are typically available in two-gallon, three-gallon, and larger pot sizes. Groundcover types are also available in one-gallon pots. Three-gallon and smaller sizes can be boxed and shipped UPS. Larger sizes are generally available for pick-up, delivery, or palletized shipments via FedEx Freight. We do not publish a retail price list, but most of our 3-gallon pots are $25-$30 each (depending on species) plus tax (where applicable) and shipping. Rarer bamboo varieties are typically priced higher and more limited in availability. To order, please email us at info@thigpentrailbamboo.com or use the Contact Us link and we will get back to you confirming availability and pricing. For an accurate shipping estimate, please also include your zip code and quantity of plants desired. In most cases, we will get back to you within one business day. For a quicker response, please call Tracy at 706-255-4901. If you need help deciding how many plants or what type of bamboo to use, please provide as much info as possible about your needs (height requirements, sun exposure, location, planting purpose, site dimensions, etc.) and we will be happy to make recommendations! We can also custom-dig large, specimen plants or contract-grow large containerized plants for situations that require an “instant impact.” See our Terms of Business for deposit and stabilization information on custom-dug and contract-grow orders. For ease of viewing here, we have divided our available bamboos into clumping and running varieties. The clumping bamboos are all non-invasive and do not need containment. For the running bamboos, containment is an issue and needs to be thought out before planting. More information on containing running bamboos can be found on the running bamboos link. 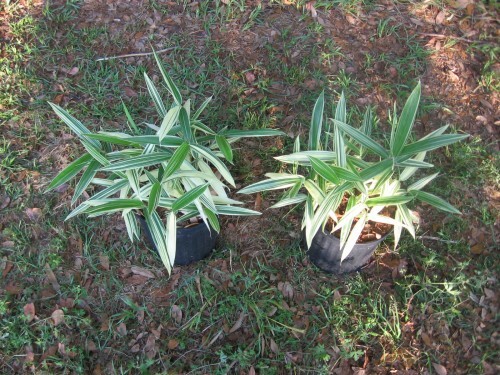 We have further sub-divided our Running Bamboos section into “Groundcover/Shrub Types” and “Taller Running Bamboos.” Additionally, for those interested in using bamboo in decorative planters, please see the Bamboos for Decorative Planters link for information on the best varieties for use in containers.